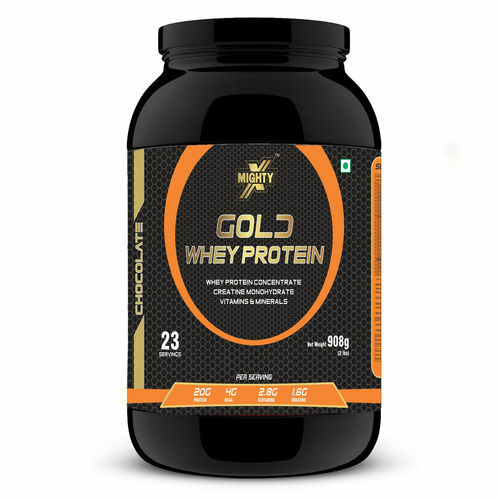 MightyX Gold Whey Protein is a great tasting high quality, non-fat protein blend is an ideal way to meet your protein requirement throughout the day. It provides a full 25g of protein per serving, plus essential nutrients to assist with your fitness goals, to help satisfy hunger and give you lasting energy. Loaded with 24 Vitamins and Minerals & All amino acids as well as protective antioxidants. It has test quality Whey Process with high protein efficiency ratio and high biological value. It promotes Lean Muscle Gain & provides strength and energy during workouts. It promotes Fat loss by release of glucagon & inhibiting insulin release. It also enhances immune system and boosts muscle growth by stimulating maximum protein synthesis. Encourages bone growth and helps to prevent Osteoporosis. It helps lower cholesterol & triglycerides. Explore the entire range of Lean available on Nykaa. Shop more MightyX products here.You can browse through the complete world of MightyX Lean .Alternatively, you can also find many more products from the MightyX Gold Whey Protein Chocolate Powder range.